At Arduino Day, I talked about a project I and my collaborators have been working on to bring machine learning to the maker community. Machine learning is a technique for teaching software to recognize patterns using data, e.g. for recognizing spam emails or recommending related products. Our ESP (Example-based Sensor Predictions) software recognizes patterns in real-time sensor data, like gestures made with an accelerometer or sounds recorded by a microphone. The machine learning algorithms that power this pattern recognition are specified in Arduino-like code, while the recording and tuning of example sensor data is done in an interactive graphical interface. We’re working on building up a library of code examples for different applications so that Arduino users can easily apply machine learning to a broad range of problems. The project is a part of my research at the University of California, Berkeley and is being done in collaboration with Ben Zhang, Audrey Leung, and my advisor Björn Hartmann. We’re building on the Gesture Recognition Toolkit (GRT) and openFrameworks. The software is still rough (and Mac only for now) but we’d welcome your feedback. Installations instructions are on our GitHub project page. Please report issues on GitHub. Our project is part of a broader wave of projects aimed at helping electronics hobbyists make more sophisticated use of sensors in their interactive projects. Also building on the GRT is ml-lib, a machine learning toolkit for Max and Pure Data. Another project in a similar vein is the Wekinator, which is featured in a free online course on machine learning for musicians and artists. Rebecca Fiebrink, the creator of Wekinator, recently participated in a panel on machine learning in the arts and taught a workshop (with Phoenix Perry) at Resonate ’16. For non-real time applications, many people use scikit-learn, a set of Python tools. There’s also a wide range of related research from the academic community, which we survey on our project wiki. For a high-level overview, check out this visual introduction to machine learning. For a thorough introduction, there are courses on machine learning from coursera and from udacity, among others. If you’re interested in a more arts- and design-focused approach, check out alt-AI, happening in NYC next month. If you’d like to start experimenting with machine learning and sensors, an excellent place to get started is the built-in accelerometer and gyroscope on the Arduino or Genuino 101. With our ESP system, you can use these sensors to detect gestures and incorporate them into your interactive projects! 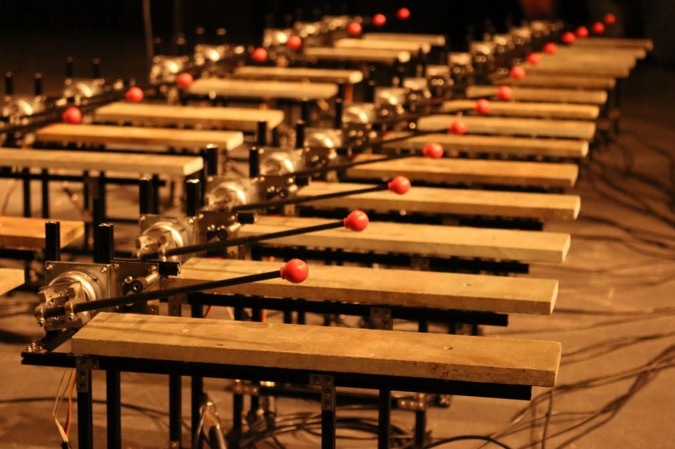 The project involved the creation of an electromechanical system capable of autonomously playing a bespoke Lithophone musical instrument. The underlying idea was to create a Lithophone that allowed the audience to literally step inside it, giving a unique spatial and acoustic surround experience. Designing an autonomous electromechanical was the thought to be the most effective and reliable solution to achieving this. [vtol] is quickly becoming our favorite technological artist. Just a few weeks ago he graced us with a Game Boy Camera gun, complete with the classic Game Boy printer. Now, he’s somehow managed to create even lower resolution images with a modified typewriter that produces ASCII art images. As with everything dealing with typewriters, machine selection is key. [vtol] is using a Brother SX-4000 typewriter for this build, a neat little daisy wheel machine that’s somehow still being made today. The typewriter is controlled by an Arduino Mega that captures an image from a camera, converts it to ASCII art with Pure Data and MAX/MSP, then slowly (and loudly) prints it on a piece of paper one character at a time. The ASCII art typewriter was recently shown at the 101 Festival where a number of people stood in front of a camera and slowly watched a portrait assemble itself out of individual characters. Check out the video of the exhibit below. The windmills have inbuilt electret microphones that were connected to an Arduino Uno. The sensor data was then sent to MaxMSP and the sounds were played with Ableton Live. 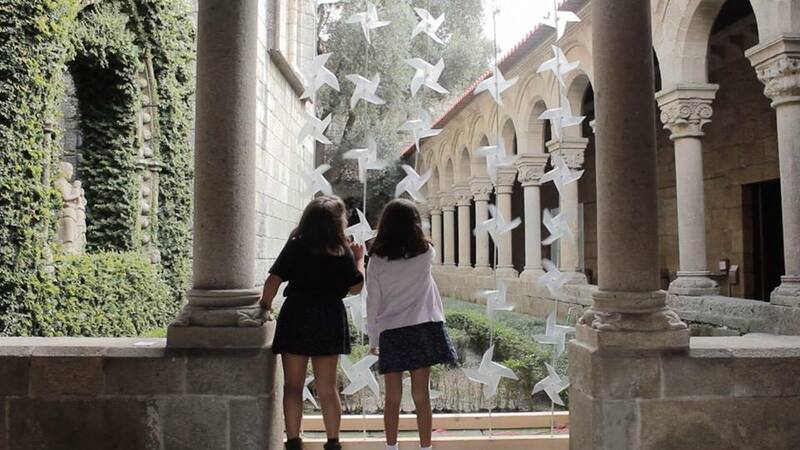 The video was shot at the cloister of the beautiful Alberto Sampaio museum in Guimarães, Portugal. Arboration controls a projected landscape based on the musical input of the user. 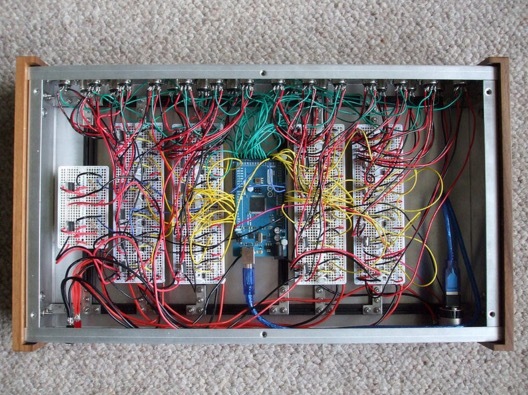 The Physical Equalizer is built upon a set of homemade flex sensors. When blocks are stacked on top of them, the volume of different instruments in the loop changes. Moritz Simon Geist has made a physical version of the famed TR-808 drum machine. Skube is a music player that allows you to discover and share music. There are two modes, Playlist and Discovery. Playlist plays the tracks on your Skube, while Discovery looks for tracks similar to the ones on your Skube so you can discover new music that still fits your taste. When Skubes are connected together, they act as one player that shuffles between all the playlists. You can control the system as a whole using any Skube. The interface is designed to be intuitive and tangible. Flipping the Skube changes the modes, tapping will play or skip songs and flipping a Skube on its front face will turn it off. The Skube is a fully functional device, not just a concept. It use a combination of Arduino, Max/MSP and an XBee wireless network. This project was made by Andrew Nip, Ruben van der Vleuten, Malthe Borch, and Andrew Spitz. It was part of the Tangible User Interface module at CIID ran by Vinay Venkatraman, David Cuartielles, Richard Shed, and Tomek Ness. You can read the details and see the inner workings of the Skube here. Julien Bayle is a digital artist and technology developer, and his work is an excellent starting point for anyone interested in the DIY man-machine interfaces. Back in 2008, Julien created a clone of the Monome, a control surface consisting in a matrix of leds and buttons whose functioning is defined by software. It was called Bonome and RGB leds were used, instead of monochromatic leds of the standard model. Here are the instructions to build it. Some time later, inspired by the DIY controller used by Monolake, Julien decided to build its own Protodeck to control Ableton Live. Recently I stumbled upon his post titled “Arduino is the Power” and I discovered that Julien has started writing a book about the Arduino platform. So I thought that regular readers of the Arduino Blog would welcome an interview with this interesting guy. And here it is! Andrea Reali: Tell us something about you. Julien Bayle: I’m Julien Bayle from France. I’m a digital artist and technology evangelist. I’m inside computers world since my dad bought us a Commodore 64, around 1982. I’m working with music softwares since the first sound-trackers and I began to work with visuals too with my Amiga 500, using some first POV-like softwares. I first began by working as an IT Security Architect by day, then I quit to be only what I am today and especially to be really free to continue my travel inside art & technology. I’m providing courses & consulting & development around open-source technology like Arduino, java/processing but also & especially with Max6 graphical programming framework which is my speciality. Max6 is really an universe itself and we’d need more than one life to discover all features. As an Ableton Certified Trainer, I’m still teaching that a bit. All technology always provides tools to achieve art. I guess my path comes from pure technology and goes to pure art. AR: How did you get interested in the area you’re interested in? JB: I always thought technology was only a tool to achieve projects, artistic or not. Progressively, I understood that pure technology could be interesting itself too and I began to learn as a maniac but without forgetting about applying theory, illustrating each bit of knowledge. I achieved the protodeck like that, progressively learning & making at the same time, encountering some solid walls but finally finding my way breaking them! Applying theory, having fun, making things, helps to keep the motivation very high and helps to achieve totally crazy projects! People thought you were insane at the beginning and the same people think you are a guru, at the end. AR: Describe one of your projects. JB: The Musée de la Buzine in Marseille is a central point of the Mediterranean cinema. Early 2011, I worked on this project both as a software designer & an hardware developer. The permanent exhibition is based on 7 rooms in which you can experience visuals, sounds contents. The system is based on 24 computers and 1 server, everything being federated by a gigabit ethernet network. There are also 7 touch screens, 10 video-projectors, 20 RFID readers, 7 arduino UNO & MEGA handling buttons and ultra-sonic sensors, and finally 2 multi channels sound systems. Yes, it is a huge installation. Max/MSP is a graphical programming environment which means you can create softwares by connecting virtual boxes on your screen without typing one row of code, if you don’t like that. It is obviously totally possible to use JAVA, C++ and more inside of it. Each system is based on the same model, in the museum. A kind of template I designed in order to provide similar features like OSC protocol communication system, RFID parsing routines for user language identification, jitter real time subtitling (subtitles on videos according to ID of RFID cards), especially. The server is able to send command to all machines. This is a nice feature to be able to switch off all 24 computers in one click and to power on them using Wake On Lan too. Of course, everything is scheduled according to a calendar and is be automated. 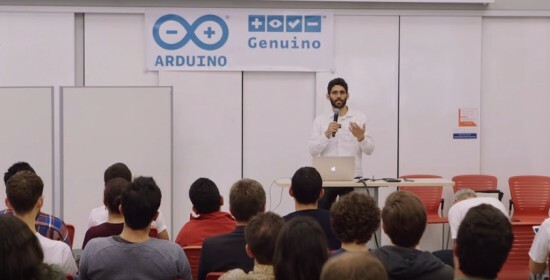 Arduino takes a particularly important role in this global design. Indeed, it adds new capabilities & skills to computers by giving them a way to feel our universe with sensors and to act on it too. In this installation, Arduino are used on the simpler way. They are reading buttons state. For instance, drawers contain secret switches: when you open a drawer, the switch is triggered and the reading loop circuit is opened too; the board detects that and send bytes to the computer via USB cable basically. The Max patch (= name of programs you make in Max) receives the bytes and act properly by triggering a video, a sound, both or lighting on something. There is a nice machine installed there : a DMX / Ethernet router. I can send special bytes over the network from my Max patch to this gear. The router then translates my messages into DMX pre-programmed sequences. For instance, I wired an ultrasonic distance sensor, used as a presence detector. The Arduino check distance and when the distance is less than a particular value, it fires a specially byte to the computer. This one reacts by triggering a sound and a video on 2 video-projectors. It also sends another peculiar byte to the DMX Router and this one makes a very nice light sequences like fadin lights in different moody way in order to grant an immersive experience to users. The presence of Arduino made this installation alive, by bringing computers to another level of interaction. I enjoyed a lot in making this complex project and people seemed very satisfied by the result. I have been asked to develop more installations like that and now I freely choose which offer to accept. AR: What skills did you draw upon? JB: This project involved a lot of different technology. I had to wire and solder a bit too, which was nice and made things more real, concrete, physical. The main thing about this project is the fact I had to mix a lot of things together. It was interesting to connect all these very open & efficient technologies. Using open protocol like serial, OSC (Open Sound Control) was a very nice way to keep things simple and indeed, I wanted to keep things simple. Designing huge projects doesn’t mean you have to raise the complexity. Often, great & big projects are based on very simple bits. My advice to readers: Keep it simple! Build some units, then connect them together progressively. This is my credo when I’m teaching Arduino! AR: When did you hear about Arduino, and when did you first start using it? It brought me into the hardware gear field. It was a nice project and I learned a lot about shift-registering, buttons matrices, LED matrices and especially RGB Leds. Arduino is THE way to learn about electronic. I also played a bit with MIDI & OSC protocol directly with Arduino board and I still have a couple of projects I’d like to make available a bit on the monome distribution model. These include a strange drone machine, a 8-bit synthesizer very raw and a little and led based sequencer but with a strong part including shuffling and random. The bootloader included in the chip provides a totally user friendly way to upload your C code from the IDE on your computer to the board. It is useable out-of-the-box without following a 3 years University cycle ! I’ll spread the arduinoword around: it can easily make people learning about electronic and especially about making their own things. Today we can follow the DIY way easily because of people like Massimo Banzi, Tom Igoe and the whole community created by the Arduino Team. They opened a road and gave people more motivation to design and build things themselves. AR: Where can readers see your works, both past and present? JB: I have 3 websites. http://julienbayle.net is the main one. You can find there my blog, and all my communities connection like Soundcloud, Facebook and more. http://protofuse.net is my music website which will be merged probably into http://julienbayle.net quite soon. Indeed, I’m known as protofuse on the IDM electronic scene. http://designthemedia.com is my small company. I’m providing Ableton Live devices & max for live stuff. I am currently writing a book on Arduino and this is the first official place where you see this news. AR: What inspired you to make the thing you made? JB: I’m both a technology-driven guy and a minimalism art admirer. I guess you can find minimalism in everything I’m making, from the apparently totally complex stuff to the most easy one. My work is a quest into minimalism & zen digital territories. My latest iOS application is a piece of work which can be felt like an artwork too. I’m making a lot of ambient music and IDM music too and from the most syncopated rhythm to the most peaceful synthesize soundscape, I feel minimalism. Artists like Autechre, Brian Eno, Pete Namlook, Aphex Twin, Arpanet, inspire me a lot. I guess my whole design (sound design, music design, software & hardware design) is inspired by artists like them, but not only. We definitively need more peace and more quietness in our world. I’m just trying to find mine making my art and trying to bring my words to people too. I wish a bright and peaceful future for Julien and I deeply thank him for the interview. 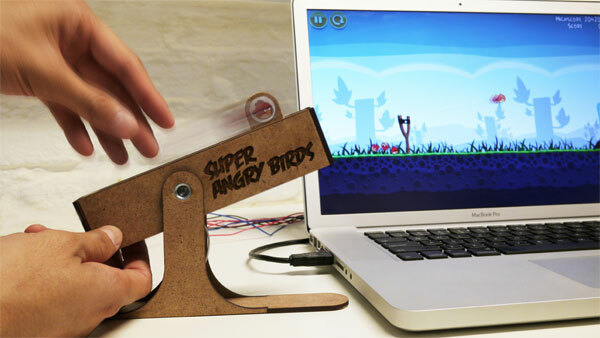 Super Angry Birds USB controller puts the sling back in your shot (video) originally appeared on Engadget on Wed, 08 Aug 2012 16:34:00 EST. Please see our terms for use of feeds.